Please Note! This site (fishcreekpond.com) is provided as a guide only. For reservations, or questions specific to reservations you must follow the instructions below and contact either the park directly or Reserve America (Fish Creek) or Reserve America (Rollins). Booking online with Reserve America. Changes and cancellations or other reservations issues are also handled by Reserve America. Looking for a site? Visit the Campsite Guide first for extensive information on every site including several photos of each campsite. 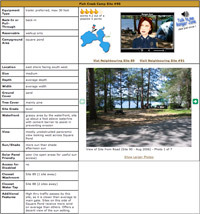 To find campsites that match your specific criteria, check out the Campers Toolkit feature. Find your way around, and explore the park using our interactive Map Navigator . Includes campsites, bathrooms, water taps, amenities, hot spot photos and much more. Have a question about the park? Just Ask Ranger Jill ! You can ask her questions about specific campsites, things to do, facts about the park and more. Book online, make changes, or cancel a reservation at Reserve America. Calling Reserve America for New York State Campgrounds at 1-800-456-2267. You can call Fish Creek Pond Campground direct for more info at 518-891-4560. Choose a site in the 1-305 range if you want a waterfront site on the main ponds. Choose a site in the C1-C17 range if you wish to be on the quiet more secluded creek that flows into Fish Creek pond. Choose a site in the A1-A22 range if you want an inland site off the water. Note: Fish Creek is extremely popular! If you are planning your vacation for the month of July or August, it is highly recommended that you book well in advance. Reservations can be made a maximum of 9 months in advance. (ie July 1st reservations can be made starting October 1st of the previous year). Camping Fees 2013: $22/night at Fish Creek, $20/night at Rollins Pond. Reserve America charges a non-refundable reservation fee of $9.00. Out of state residents are charged a $5 per night surcharge. To cancel a reservation more than 2 days prior to the date of your arrival, cancel online or contact Reserve America at 1-800-456-2267. To cancel a reservation within 2 days of your arrival, call the campground at 518-891-4560. The cancellation fee is $9. If you cancel 8 days or less prior to your arrival date, you will also be charged the first nights camping fee ($22) along with the cancellation fee. The fee for a reservation change is $9. A maximum of 14 day cumulative camping may be booked between July 1 and Labour Day at Fish Creek. Minimum stay on a reservation is 3 days (online or by phone).